Greenbank Self-cateringA very popular 17th century Grade II listed cottage in a delightful setting at the foot of Hartsop Dodd in the Hartsop conservation area about five minutes walk by footpath to Brotherswater and only one mile from the Brotherswater Hotel which serves bar meals etc. The area is excellent for either touring or relaxing and there are many walks from the cottage - The High Street Ridge, Place Fell, St. Sunday Crag, and the Fairfield hills all being within striking distance. Enjoy also a cruise on Ullswater - one of our most beautiful lakes. The cottage is reached along a good track and stands at the end of a small cluster of character properties. Accommodation: Greenbank is all on ground level with front door into central hallway. Cosy sitting/dining room has a log burning stove (TV with Freeview (Sky) and DVD recorder, free Wi-fi) and three windows with views across to open fells and garden. Newly fitted kitchen, though small, is well-planned with an exposed stonework wall and door to back garden. There are two bedrooms - the double has three windows overlooking the garden and the twin room has views towards Hartsop Dodd. Bathroom has bath with shower over, basin and wc. 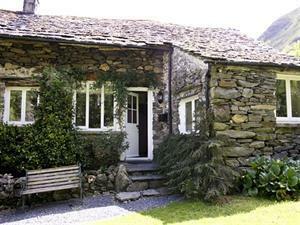 The whole cottage is surprisingly light and airy with oak lintels supporting the thick stone walls. Exposed beams add to the character feel as do the dressed slate floors. Storage heaters throughout. Immersion heater. Outside: Delightful sunny cottage style garden with small stream. Garden furniture provided. Private parking for up to two cars. Nearest pub/shop at Brotherswater approx 1 mile, other shops in Patterdale approx 2 miles. Note: Wi-fi is for surfing and email only, no downloading. Phone for incoming and emergency outgoing calls. Sorry, no high chair available. One well-behaved pet accepted * non-smokers only * duvets/beds made up for arrival * electric cooker and hob * dishwasher * auto washer * dryer * fridge with small ice box * microwave * phone for incoming and outgoing emergency calls * all fuel included * fuel for log burning stove can be purchased at the Patterdale Post Office * free Wi-fi (surfing and email only, downloading is not possible due to bandwidth) * travel cot available - please order * sorry no high chair * towels available - please order. Please note: The google map alongside is incorrect as Sykeside Camping in actually on the other side of the A592 about half a mile away. The marker for the cottage is in the right place. We have tried to alert Google in an effort to make this correction. A very popular 17th century Grade II listed cottage in a delightful setting at the foot of Hartsop Dodd in the Hartsop conservation area about five minutes walk by footpath to Brotherswater and the local pub that serves bar meals. Greenbank offers weekly bookings starting on Saturday.